IMGP5962, originally uploaded by Mic2006. We hiked through a jumbled terrain of massive slabs fallen from the cliff face and rounded boulders that have been washed by epic wind-spawned storms. As entrances go these sea caves far surpass others that I’ve seen, though admittedly there are few sea caves to rival Rover’s some distance further along the shore. In the picture above Jeff and I have been hiking and reached the end of dry land. Further progress would have to be through Georgian Bay’s icy water. What I found most intriguing about Cave Point was its sea caves part way up the cliffs. For the most part it looked like difficult climbing and I’d imagine few if any people have ever visited some of those harder to reach places. 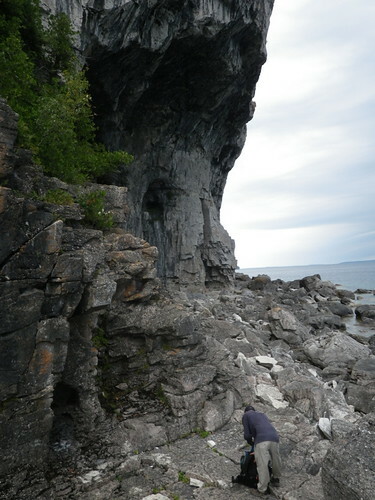 Our initial idea had been to see if we could locate low-lying bedding plane squeezes close to the water line as we are aware that not every opening in this area is a sea cave, there is huge potential for solution caves and as has already been discovered, there are nearby that are intensely decorated with speleothems. Adventure travel in Ontario – Exploring Marble Caves, originally uploaded by Mic2006. 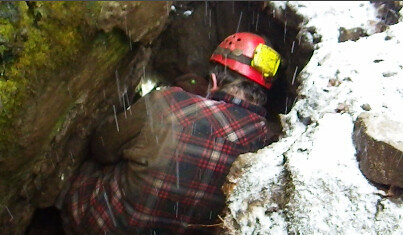 What is adventure travel in Ontario is for cavers a regular Sunday afternoon. Rob, Jeff, Jeff and I revisited this marble cave to hopefully explore other, thus far un-visited passages. 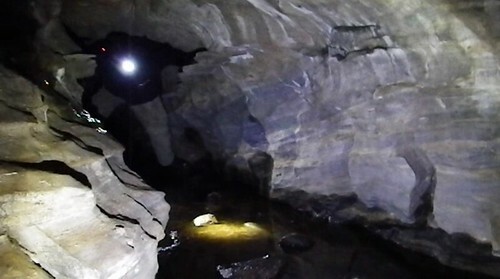 At this time we have discovered several other likely cave leads in the area, in particular, a sinking stream (thanks Steve M.) with massive potential for tunnels, but unfortunately it will take some land-owner permission and then a concerted effort by a team with capabilities of heavy rock removal. 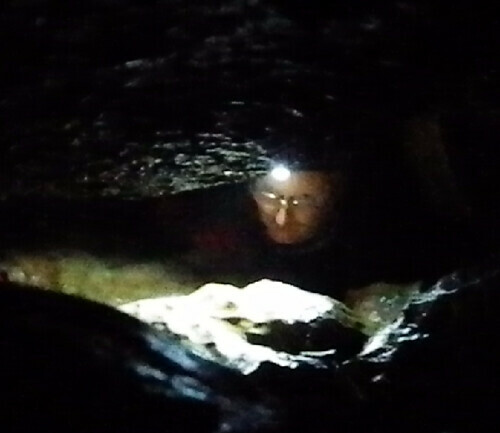 Within our already visited cave we explored out into the darker nooks that I had missed last visit. We found several going passages. This particular spot as seen above – with the wad of flowstone marks the entrance to a tube that we are yet to explore. Getting to this spot is somewhat disarming as you wade through about 18 inches of water and 2-3 feet of soupy mud. Every step causes the water around you to literally boil with escaping methane. You can feel sticks and branches down beneath the mud and in their decomposition they are releasing gas. I am wondering what effect open flame might have on the journey across the expanse that leads to this spot. 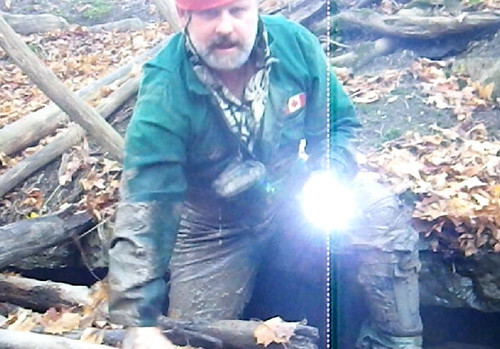 Anyway – distant as this location is from my home in Guelph, it seems to be rife with caving possibilities so the focus for our caving exploits seems to be increasingly concentrated in this area. There are many karst features in the limestone right at the edge of the shield – in part due to the rocks natural suitability and in part due to the acid water running off the shield.